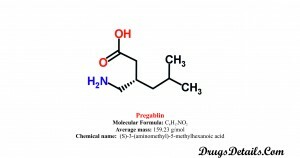 Pregabalin is a gamma-aminobutyric acid (GABA) derivative, a synthetic medication that is used for the treatment of neuropathic pain (pain arising due to damaged nerves), epilepsy (brain disorder characterized by recurring seizures), fibromyalgia (condition characterized by muscular or musculoskeletal pain with stiffness and localized tenderness at specific points on the body), and generalized anxiety disorder. The drug is marketed under generic name Pregabalin and brand name Lyrica. Besides this, the drug is also available under several brand names worldwide, such as Galinerve, Gabamax, Gabafit, Maxgalin, Gabasafe, Peganex, Nuramed, Pevesca, pregab, Progab, Proage and Pregaba. Pregabalin chemically belongs to the class of organic compounds which are known as Gamma amino acids and derivatives (Gamma-aminobutyric acid derivative, GABA). 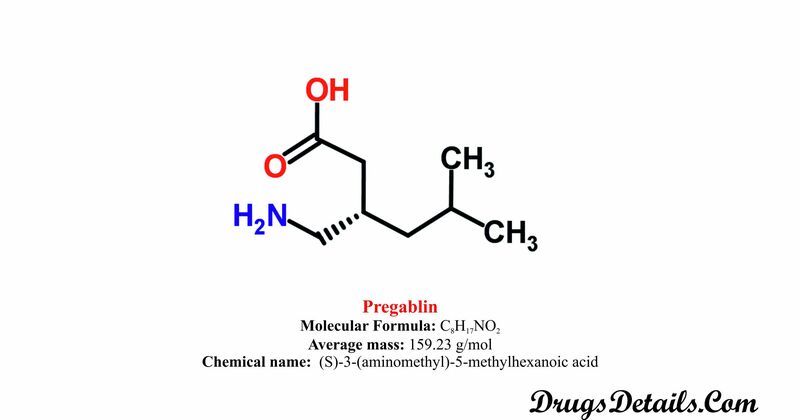 Pregabalin is chemically known as (S)-3-(aminomethyl)-5-methylhexanoic acid. The drug Pregabalin is commercially available in the form of capsule and oral suspension or solution for administration through mouth. The capsules are available in different dosages or strength of 25 to 300 mg, while oral solution is available in strength of 20 mg/mL. 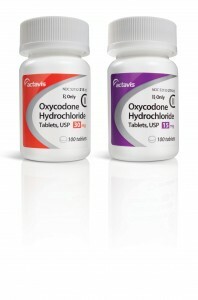 Oxycodone is a semisynthetic molecule that is used to treat moderate to severe pain. The drug is an opioid medication that is synthesized from plant alkaloid thebaine. The alkaloid is extracted from Persian poppy. It is one of the many opioid alkaloids found in the opium poppy. Chemically, the drug is a narcotic (addictive drugs that affect mood and behaviour) and analgesic. The drug was first developed and became available for clinical use since 1917. The drug is available under generic name Oxycodone and marketed under brand names Roxicodone, OxyContin, OxyIR, and Oxaydo. Oxycodone is chemically known as (1S,5R,13R,17S)-17-hydroxy-10-methoxy-4-methyl-12-oxa-4-azapentacyclo[9.6.1.0¹,¹³.0⁵,¹⁷.0⁷,¹⁸]octadeca-7(18),8,10-trien-14-one and belongs to the class of morphinans. The tablets for oral administration is available under various dosage or strength such 5 mg, 10 mg, 15 mg, 20 mg or 30 mg, which contain an equivalent amount of Oxycodone hydrochloride USP. 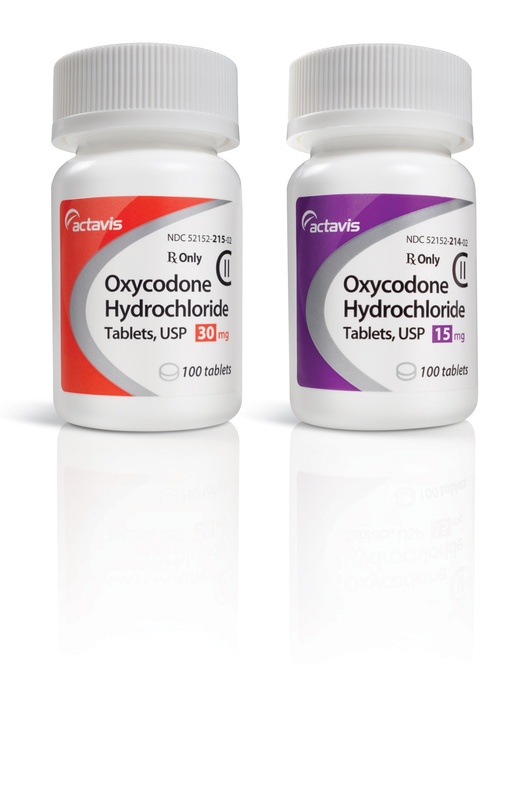 Parental formulations of Oxycodone is also available as 10 mg/mL and 50 mg/mL for intravenous (IV) or intramuscular (IM) administration. Oxycodone: Structure and chemical information. Pregabalin is a synthetic, gamma-aminobutyric acid (GABA) derivative that blocks calcium channels and functions as anti-convulsant, anti-epileptic, anxiolytic, and analgesic agent. The exact mode of action of Pregabalin remains unclear and the proposed mechanism is based upon results involving genetically modified mice and compounds that are structurally related to the drug such as gabapentin. Besides this, Pregabalin also lowers the release of several other neurotransmitters, including glutamate, noradrenaline, and substance P possibly by modulation of calcium channel function. However, the significance of this effect remains unclear. Although Pregabalin is a structural derivative of the inhibitory neurotransmitter gamma-aminobutyric acid (GABA), it does not bind directly to GABA or benzodiazepine receptors. The sodium channels, opiate receptors, and cyclooxygenase enzymes do not play a role in the mechanism of action of Pregabalin. The drug is also inactive at serotonin and dopamine receptors and does not inhibit reuptake of the serotonin, dopamine, or noradrenaline. Pharmacodynamically Oxycodone is similar in action to that of hydrocodone and morphine. The most prominent sites of action of Oxycodone involve central nervous system and smooth muscle organs. It acts directly on mu, kappa, and delta opioid receptors as agonist. The opioid receptors are a group of inhibitory G protein-coupled receptors and present within the central nervous system (CNS) of the brain. Oxycodone is mainly affected by mu-type opioid receptors, which act as a positive and negative modulators of synaptic transmission via G-proteins. Interaction or binding of the Oxycodone opiate stimulates the exchange of GTP for GDP and decreases intracellular cAMP by inhibiting adenylate cyclase. Yes, Pregabalin in combination with Oxycodone represents a valuable addition to the existing monotherapy with either Oxycodone or Pregabalin alone in patients with neuropathic pain. It has been observed that Pregabalin is safe and effective in patients with postherpetic neuralgia, trigeminal neuralgia, painful diabetic neuropathy and fibromyalgia. However, the drug is less effective in monotherapy in treatment of pain associated with HIV neuropathy and other neuropathic pain. For this purpose Pregabalin is occasionally recommended in combination with other analgesic agents such as Oxycodone. Similarly, single analgesic drug like Oxycodone has less perfect therapeutic/adverse effect profile for every pain condition. To improve the compliance, Oxycodone in combination of Pregabalin, Gabapentin, Acetaminophen, Paracetamol, NSAIDs and Morphine offers greater pain relief and/or reduced adverse effects than the constituent drugs when used individually. Clinical studies have suggested that the combination of Pregabalin and Oxycodone are safe and effective and may offer certain advantages. Recent open-label study of neuropathic pain patients suggests that Pregabalin may provide greater analgesia and opioidsparing effects. Combination therapy of Pregabalin with Oxycodone is significantly more effective for pain relief and significantly improves quality of life compared to monotherapy. It is always recommended that analgesia should be dose–limited when used in combination due to their increased side effects. Caution should be taken before using Pregabalin in combination with Oxycodone. Oxycodone and Pregabalin can be taken together at the same time to treat neuropathic pain. However, the dose should be adjusted by professional healthcare, if needed. Do not use the medicine if you are hypersensitive or allergic (e.g., anaphylaxis or Stevens-Johnson syndrome) to Oxycodone or any other opioid drug or -aminobutyric acid (GABA) derivative or to any ingredient of the drug formulation. The Oxycodone and Pregabalin may interact with other drugs. Therefore, care should be taken when you are taking any prescription or non-prescription medicines and herbal or vitamin supplements. It is advisable that you do not start, stop or change or take any medicine unless you have discussed with your doctor or professional consult. Before taking Oxycodone-Pregabalin, tell your doctor about your medical history if you have kidney disease, liver disease, asthma, liver disease, mononucleosis (also called “mono”), a bleeding or blood clotting disorder, or any type of allergy, hay fever or hives. Oxycodones in combination with Pregabalin exacerbate the side effects such as drowsiness, dizziness, confusion, difficulty to focus properly, impairment in thinking, judgment, and motor coordination. These side effects are more in elderly population therefore it is recommended to avoid the activities which require alertness such as operating dangerous equipment or machinery, driving etc. It has been observed that opioids such as Oxycodone are narcotic and therefore have the strong potential for dependence and withdrawal. Furthermore, misuse, overdose and diversion can lead to severe consequence including death. It is therefore suggested that treatment should be taken under professional guidance and supervision.